Click on one of the thumbnails below to access the 12 photos of this aircraft. Yale #3350 was donated to the Museum in the early seventies by William Gregg. Ground up restoration of Yale #3350. 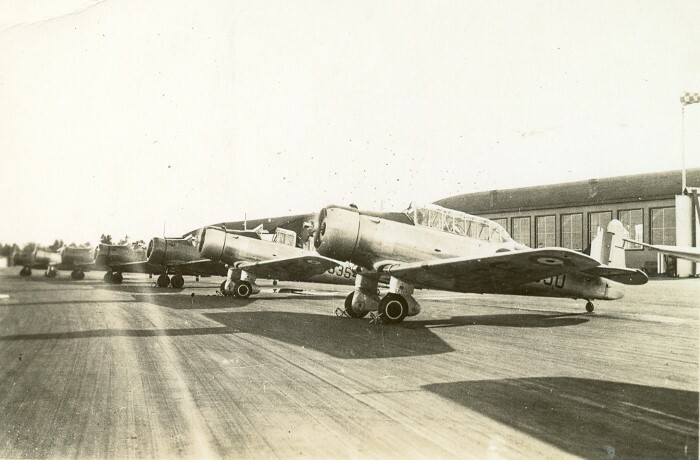 A line up of Yales (#3350 in the foreground) and a Boeing 247. 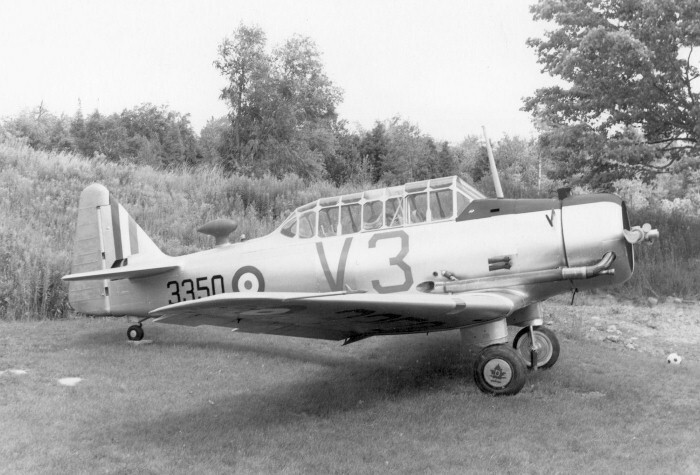 Yale #3350 at Camp Borden, Ontario. The pilot of Yale #3350 made an unauthorized visit to Hamilton Airport in 1944 to visit his girlfriend. He was stationed at Camp Borden. By then, #3350s paint scheme has changed as it is now a wireless trainer. 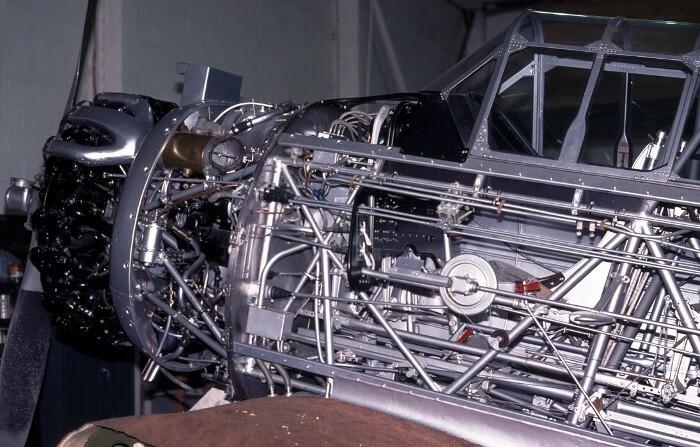 Yale #3350 as a wireless trainer with a large V3 added to the fuselage. 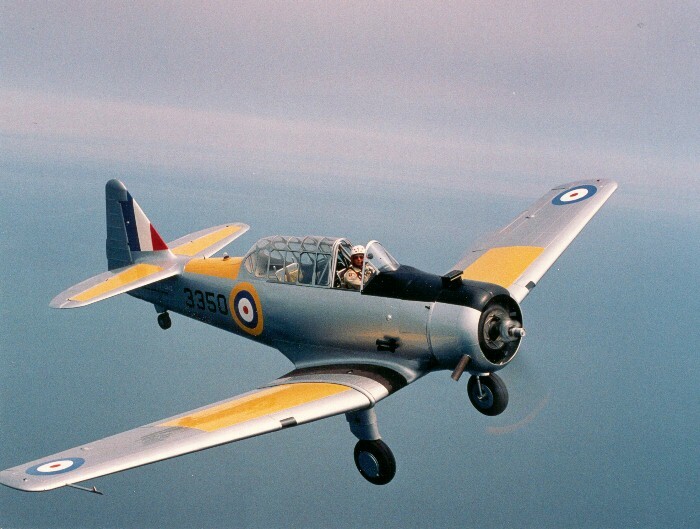 The North American Yale is an earlier fixed undercarriage version of the famous Harvard trainer. 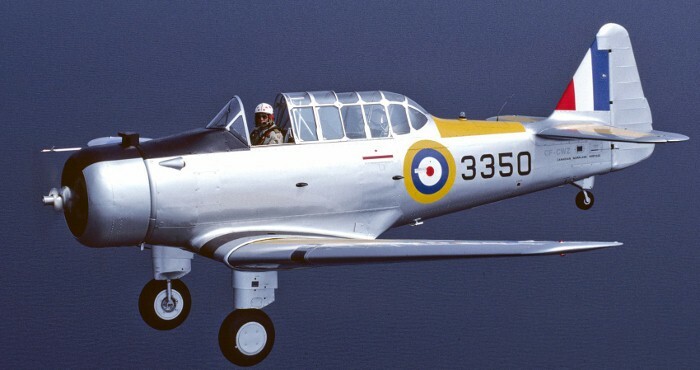 Ordered by the US Air Corps as its first modern trainer, the BT-9 first flew in April 1936. Later, the French Armed Forces ordered substantial numbers of them, most of which were delivered before France fell to the Germans in June 1940. About 120 aircraft remained in California awaiting shipment, so North American asked the British Government if they were interested in them. The reply was positive, so designated as the “Yale”, the aircraft were sent to Canada for the British Commonwealth Air Training Plan. 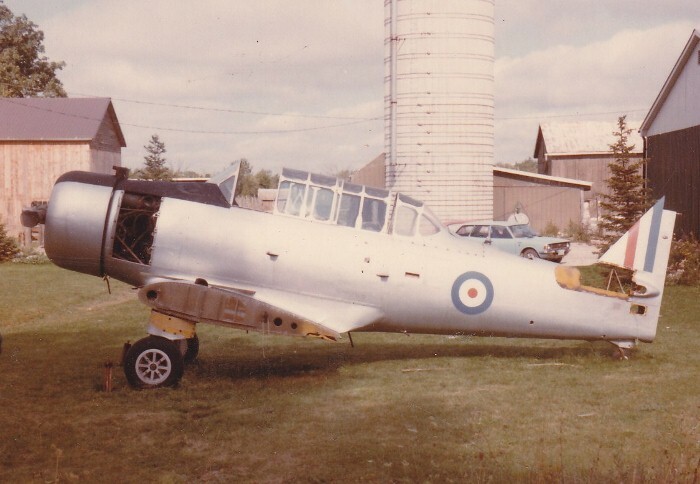 By August 1940, Yales were flying with No.1 Service Flying Training School (SFTS) at Camp Borden, Ontario and later three other SFTS in Ontario received them. 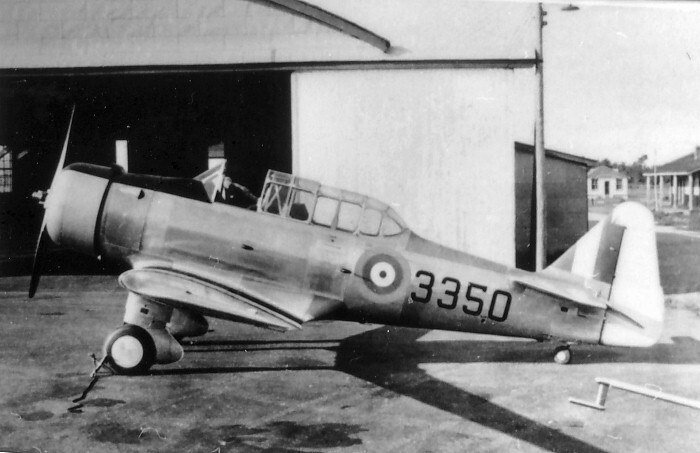 Yales continued to fly in this role until October 1943, when they were withdrawn from pilot training. 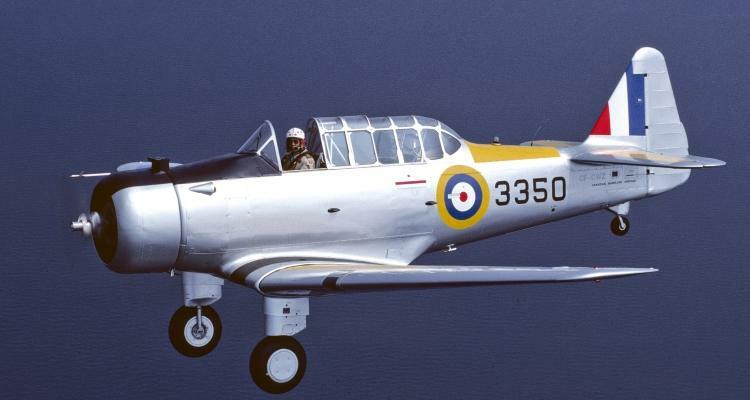 The RCAF had found that an intermediate trainer was not required. The Yales then went on to a second career as wireless operator trainers. 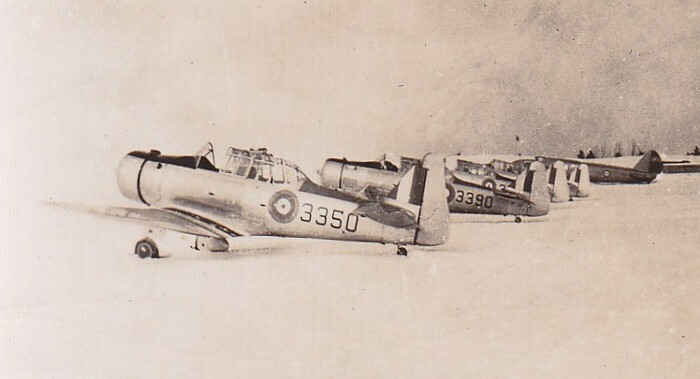 The aircraft were sent to all four RCAF Wireless schools and in this role, they continued on until the end of the war when they were retired. Undoubtedly the Yale would have disappeared completely, had it not been for Ernie Simmons. He purchased 39 Yales from the Canadian Government in 1946. These aircraft were stored on his farm at Tillsonburg, Ontario, in the hope that the government might need them again. 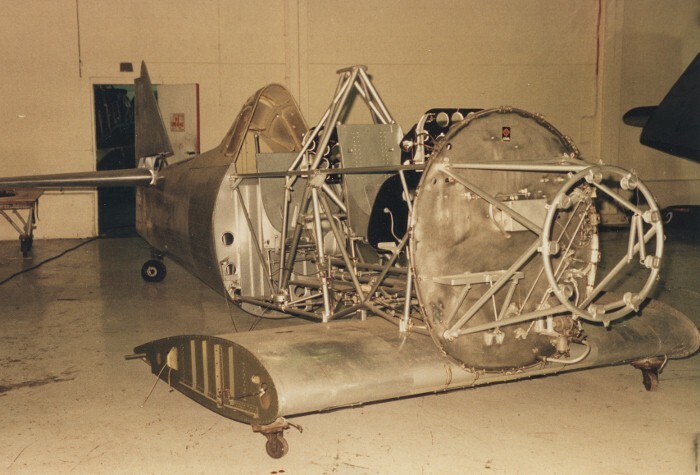 In 1971, his aircraft collection was auctioned after he died and many Yales then became available for restoration. 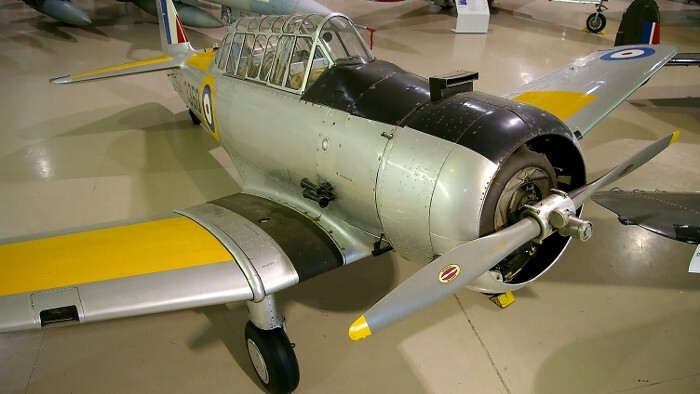 The Museum's Yale served at No.1 SFTS Camp Borden, Ontario from 1940 to 1943 and then at RCAF Wireless Schools in Ontario until 1945. It was sold as war surplus to Ernie Simmons and sat derelict until 1971. The aircraft was purchased by William Gregg, who donated it to the Museum. 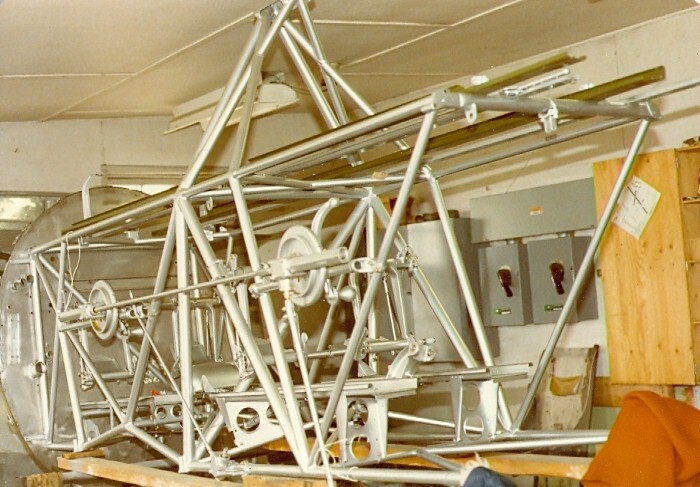 Another 20 years were spent restoring the aircraft to flying condition. It now displays the colours and markings it had at Camp Borden in 1940.